Picture this: The yard waste container is filled to the brim, but the pick-up day for yard debris is more than a week away. The first thing to do is to take a break from the kind of yard work that generates more debris. The next thing is to wonder whether weekly service, rather than every other week, would be a good deal. 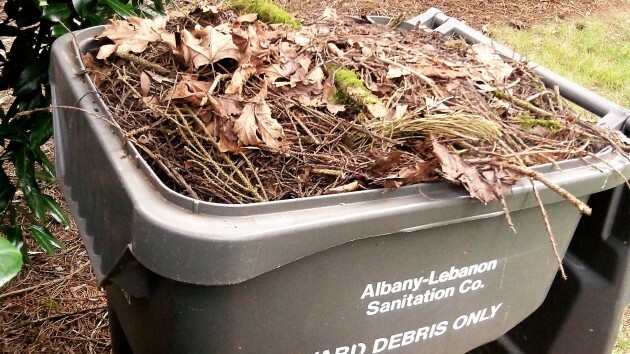 In March 2015, Republic Services, the Albany disposal franchise holder, asked the council whether it was interested in having the company make weekly instead of biweekly yard debris collections. This would allow customers to add their food waste to their yard debris to be turned into compost. But the change would have a price. It would raise the bill of trash service by $3 a month for all customers, not just those who wanted yard waste picked up every week. The council turned down the change last year. But on Wednesday Bill Root, a North Albany resident who had spoken up in favor of weekly yard waste service then, brought it up to the council again. Councilors reacted the same way they did in 2015. Why should people have to pay extra for something they may not want and don’t need? That seemed to be the prevailing attitude on the council, and it’s hard to disagree. Or not wait until June to rake up leaves that fell last Fall. As do my neighbor and I I. Great neighbors are gold. Or they could get a shredder and reduce the leaves by a bunch and then they probably would fit in the every other week pick up. Here’s another example of liberal thinking. If a liberal wants to achieve what (s)he thinks is a noble goal, everyone should pay for it whether it benefits them personally or not. The system is fine just as it is: if you use it, you pay for it. If you don’t, you don’t. Thanks, Council. It will be a slow creep down I-5 from Portland where food waste recycling is required. We may never see that here in the hub of the Willamette Valley which …I think…. 99% of commenters would agree that is “a-ok”! Every time my brother in-law complains about food waste recycling I just laugh and laugh! 6 months and those wanting it be billed for it. I have two yard debris bins that get used year round. I pay for that because I have a high-maintenance yard. Definitely don’t expect my neighbors to pay to keep up my roses or the rest of my jungle. Residential food waste/yard waste recycling in Corvallis is picked up weekly. and works great. It’s amazing how much of the trash is actually compostable. Between the commingled and organic carts, curbside monthly glass pickup, and the Republic Services recycling center, I hardly have any garbage left. I wish food waste recycling was used more often by restaurants and other food service operations.